Woodburn struck from close range as the game ticked into stoppage time, the Liverpool teenager chesting home Will Vaulks' cross for his second Wales goal. Manager Ryan Giggs will be grateful for the win - his fourth from his 10 games - as Wales head into a tournament that the former Manchester United star says will define his time in charge. But Wales' young strikeforce were largely devoid of ideas, although George Thomas saw a headed effort ruled out for offside midway through the second half. Ten minutes earlier the Soca Warriors had almost taken a shock lead when Aubrey David's powerful shot was cleared off the line by Chris Gunter. 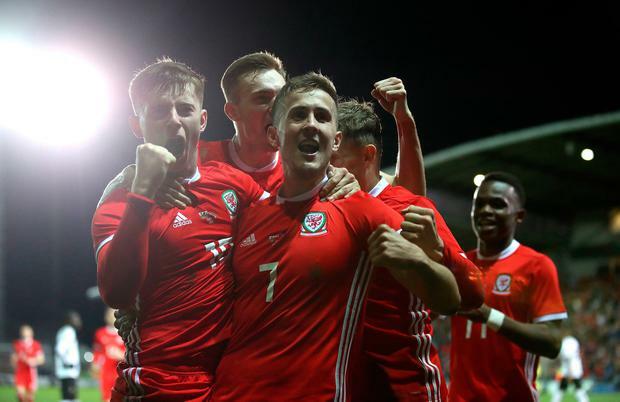 The game marked Wales' return to Wrexham for the first time since a 3-0 victory over Norway in February 2008 and added another chapter to the Racecourse Ground's rich history. The ground is recognised as the world's oldest football stadium that still hosts international matches, having staged Wales' first home match in 1877. Wales had won the only previous game between the two nations - a 2006 friendly that was played on neutral Austrian territory and was notable for Bale becoming his country's youngest-ever player at the age of 16 years and 315 days. The visiting goalkeeper was also well-positioned to deny Hedges and Woodburn, but he was grateful for Thomas' wayward attempt after Lee Evans had picked him out on the edge of the area. The Soca Warriors' only effort of note in the first half saw Danny Ward easily gather Khaleem Hyland's effort from 25 yards, but replacement goalkeeper Adam Davies had more cause for concern and was grateful for Gunter's goal-line intervention. Thomas stung Phillip's palms and saw what would have been his first international goal disallowed, and there appeared no way through for Wales until Woodburn popped up to supply the winner from Vaulks' excellent cross.